Samsung finally laid the speculation to rest and announced the Galaxy A9 (2018). 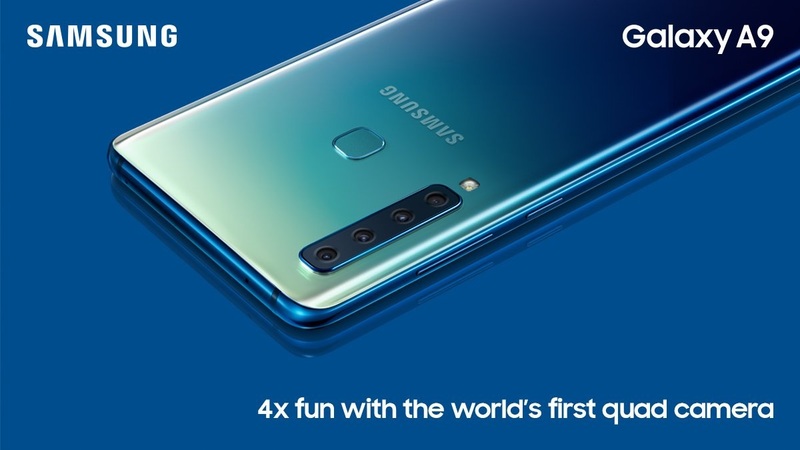 As the earlier rumors suggested, the four stars of the show sit around back, as the Galaxy A9 (2018) features not one, not two, not three, but four rear cameras. Theoretically, so many rear cameras allow for an incredibly flexible photography platform the likes of which we have not seen before. But will that be the reality? Time will tell. For now, let’s find out what the Galaxy A9 (2018) offers on paper. 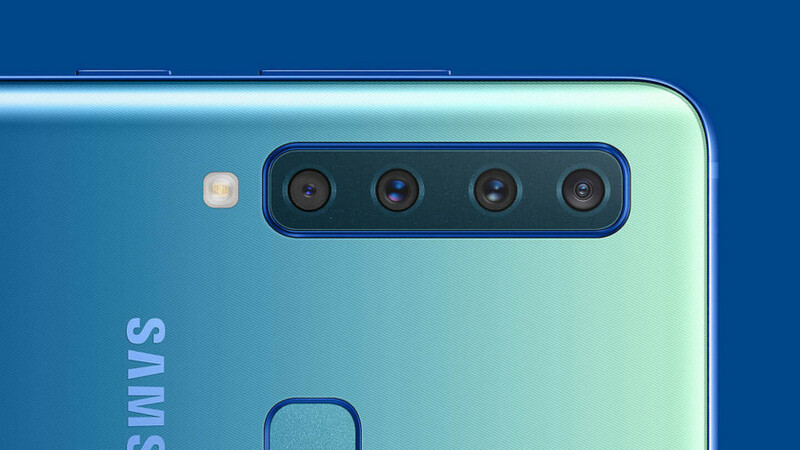 The story of the Galaxy A9 (2018) starts and arguably ends with the four cameras around back. This is the first time a smartphone features so many rear cameras, outdoing even the LG V40 ThinQ and Huawei P20 Pro. Numbers are not everything, however, so let us dive a bit further into the cameras and how the magic happens. Going top to bottom, the first camera is an 8MP ultra-wide sensor with an f/2.4 aperture and 120-degree field of view. Next up is the 10MP telephoto lens with an f/2.4 aperture and 2x optical zoom. The third camera is the main 24MP sensor with a wide f/1.7 aperture, while the fourth camera is a 5MP sensor with an f/2.2 aperture. That last camera captures depth information and allows for the phone’s Live Focus feature. The Galaxy A7 2018 (left) and the Galaxy A9 2018 (right). Taking advantage of the four cameras are 19 image enhancement modes. Each mode offers custom settings for things like food, landscapes, portraits, plants, night scenes, and more. The phone also detects when the subject blinks or is blurry, which should prevent you from taking awkward pictures. How Samsung managed to cram this many cameras so close to each other is a conversation for another day. What we can say is that this is a feat of engineering that other companies will likely try to mimic or are already testing. The Galaxy A9 (2018) simply managed to be the first real-world product to do it. Whether the four cameras can produce respectable pictures, however, is another story. Phones like the Pixel 2 and P20 Pro have set a very high standard for smartphone photography, and we hope that the Galaxy A9 (2018) is not content with just being the first to feature as many rear cameras as it does. Again, four cameras. That is all. The Galaxy A9 (2018) might not be a flagship, but it keeps pace with its more powerful siblings in more than a few ways. From the always-on display and fast charging to the rear-mounted fingerprint sensor, facial recognition, and headphone jack, the phone keeps up with the Galaxy S9 and Galaxy S9 Plus. Elsewhere, the Galaxy A9 (2018) features a 6.3-inch Super AMOLED display with a 2,220 x 1,080 resolution and 18:9 aspect ratio. Bezels around the sides are kept to a minimum, and there is no notch in sight. Under the hood is the octa-core Snapdragon 660 chipset — the Nokia 7 Plus and BlackBerry Key2 notably feature the same processor — and 6GB or 8GB of RAM. The 128GB of storage is impressive, with the microSD card slot able to tack on up to an additional 512GB. The Galaxy A9 (2018) even outdoes some of its more powerful siblings with its 3,800mAh battery, which should deliver superior standby times, given the processor choice and display resolution. Even the looks are subjectively better than the Galaxy S9 and Galaxy S9 Plus’. Similar to the P20 Pro, the Galaxy A9 (2018) features a gradient around back that goes from pink, blue, or black at the bottom to a lighter hue of those colors at the top. You do lose out on a feature or two, such as wireless charging and the main camera only featuring one aperture. We also get Android 8.0 Oreo, which is inexcusable given Android 9 Pie’s availability. How much those four cameras are worth it to you will likely come down in price. The Galaxy A9 (2018) starts at €599 in Europe and £549 in the UK (~$725). This makes the phone more expensive than the OnePlus 6, which features flagship specs for £469 ($529). The A9 is even more expensive than the Pixel 2, which continues to be one of the best Android smartphones for photography and is still a solid recommendation. The Galaxy A9 (2018) release date is set for November and it’s coming in Caviar Black, Lemonade Blue, and Bubblegum Pink. The full list of launch markets is still to be confirmed. And that is the Galaxy A9 (2018). Four rear cameras can only get you so far, but this is still an incredible feat for any smartphone. Whether the rest of the package is worth the price tag is up to you, but we would not blame you if you decide to live the quad camera life. Let us know what your thoughts on the phone are in the comments below and don’t miss our more detailed look at the Galaxy A9 (2018) specs at the link.